Here we have an excellent comic book disguised as an excellent children’s book. Mo Willem’s ELEPHANT & PIGGIE books have won Geisel awards. They are vetted by early-learning specialists. They are immensely popular and just downright awesome. What nobody talks about is that Willems has crafted a perfect batch of comic book primers. Now I don’t know if that was intentional or not, but he does hail from the animation industry. So at the very least he’s been having some fun with an art form he’s surely familiar with. 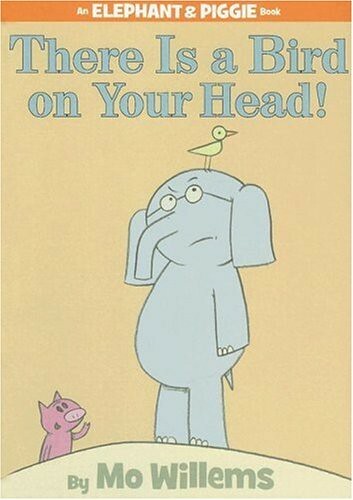 In any given volume we find Gerald the elephant and his best friend Piggie (the pig) playing a game or trying to fly or simply having a conversation about what to wear to a party. The stories are told entirely through the dialogue between the two friends with the occasional cameo from a squirrel or some other mammalian passerby. Willems really knows how to use the language of comics to set a rhythm. Each page works as a panel and he doesn’t waste a single one whether it’s a silently thoughtful moment or a loud elephanty outburst. Piggie and Gerald interact on page like a couple of stage performers who have spent years honing their act to comedic perfection. The simple renderings manage to capture certain subtleties of emotion as well as laugh out loud facial expressions. And there’s this one book where Piggie wears a big cardboard box and a colander on his head and she walks around like a robot. Now that’s the kind of stuff that wins Geisel Awards. I learned firsthand what a fun and effective learning tool these are. After a few bedtime readings, my three year old daughter was reciting the dialogue and sound effects back to me every time. She quickly associated each picture with the accompanying word balloons. She even yelled at the top of her lungs when the word balloons were appropriately huge ( but I like to think she learned that from my own expert line readings). You can see all of Mo Willems other popular books HERE. Sure, everybody is all like “Oh, his pigeon on the bus book is the best thing ever!” but - and this is in no way meant to disparage the pigeon - Gerald and Piggie are truly where it’s at. The titles are so awesome.